Mercedes redesigned E class gets its styling and technology from the more expensive S- and CL-class vehicles. The E class goes on sale in midsummer. DETROIT — The night before the start of the auto show press preview, Mercedes-Benz gave journalists here a glimpse of its 2010 E class with edgy new styling and technology from its more expensive S- and CL-class vehicles. Pricing won't be announced for several months, but Mercedes is expected to continue its aggressive strategy — similar to the positioning of the new-generation C class. While adding considerable technology, Mercedes-Benz is likely to hold the line and keep the model at a base price of about $55,000, according to insiders. Even though Mercedes chose to "reveal" the car in Detroit (and to release photographs of the car and information about it), the viewing was limited to invited guests from the global automotive media community. The car was not displayed on the show floor. The public will get its first look at the car at the Geneva show in March, presumably followed by a show debut in April in New York. 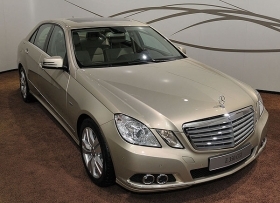 The E class goes on sale in midsummer as the E350 and E550. An all-wheel-drive model, the E63 AMG performance version, and the E350 BlueTec 50-state clean diesel go on sale in 2010. The most striking difference is rectangular headlights that debuted last fall on a concept car at the Paris auto show. The E class also will get a coupe and convertible, replacing the CLK range. Only the sedan was seen in Detroit. As standard features, the E class will have systems such as attention assist, which monitors steering response and detects drowsiness — giving drivers an audible warning as well as a message on the instrument panel. From the S class, the E class gets blind spot, night view and lane departure warning assists, as well as radar-assisted braking. Dieter Zetsche, CEO of Daimler AG, said the drowsiness assist "is the next best thing to handing the driver an espresso" and noted the symbol on the panel is a coffee cup. Mercedes-Benz executives believe that the boldness of the styling combined with the extras will help sales, even in today's depressed market.